It is found below the clavicle that is why it is called subcalvian artery. It’s the primary source of blood supply to the upper limb and therefore termed artery of the upper limb. On the other hand, the subclavian artery also supplies appreciable part of the thoracic wall, head, neck and brain via its branches. The point of origin is from the brachiocephalic trunk supporting the right sternoclavicular joint in the root of neck. The left subclavian artery originates from the arch of aorta in the thorax. It runs upwards on the left mediastinal pleura and makes groove on the left lung and enters the neck by passing behind the left sternoclavicular joint. 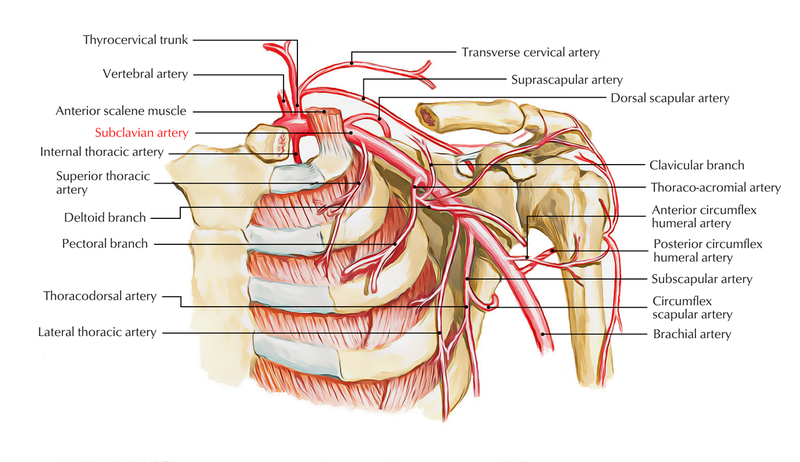 Based upon their origin, the right subclavian artery has only cervical part on the other hand the left subclavian artery has thoracic in addition to cervical parts. The cervical part goes from sternoclavicular joint to the outer border of the very first rib. In the neck, both the arteries pursue a quite similar course. 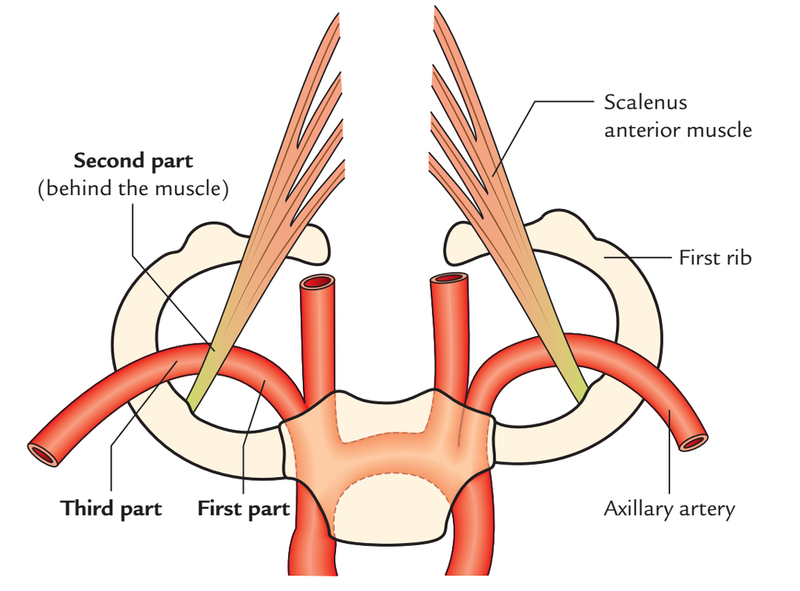 On every side, the subclavian artery arches laterally across the anterior surface of the cervical pleura onto the very first rib posterior to the scalenus anterior muscle. At the outer border of 1st rib, it finishes by becoming axillary artery. At the outer border of first rib where the subclavian artery continues as the axillary artery. First part-goes from origin to medial border of scalenus anterior. Second part-is located behind the scalenus anterior muscle. Third part-goes from the lateral border of scalenus anterior to the outer border of the very first rib. The subclavian artery normally produces 4 branches. All of them originate from first part with all the exclusion of costocervical trunk, which on the right side originates from the next part. Costocervical trunk (on left side only). Costocervical trunk (on right side only). Dorsal scapula artery: It’s an occasional branch which could originate from the 3rd part of the subclavian artery. When present, it replaces the deep branch of the transverse cervical artery. 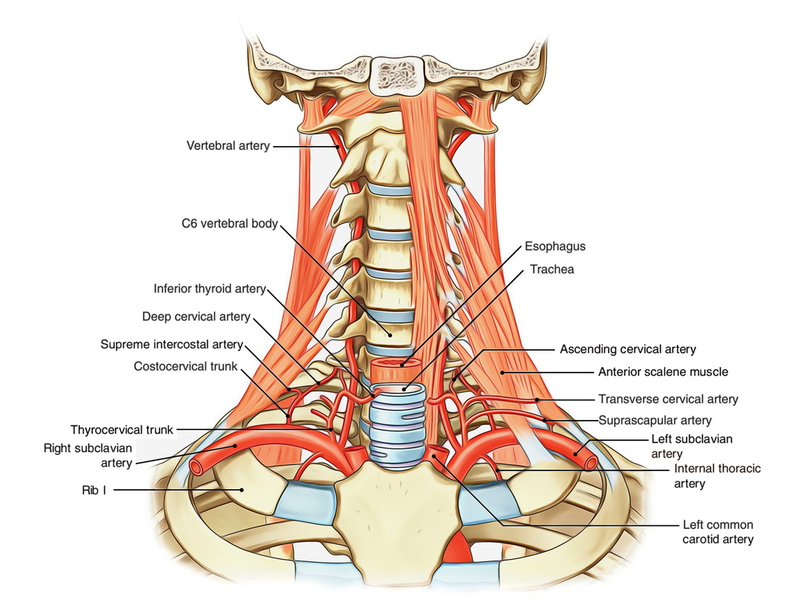 The common carotid artery, internal jugular vein, vagus nerve, vertebral vein, phrenic nerve, sternocleidomastoid, sternothyroid and sternohyoid muscles. Thoracic duct (only on the left side), cardiac branches of the vagus and sympathetic trunk; and ansa cervicalis (encircling the subclavian artery) and phrenic nerve on the left side only. Apex of the lung covered by the cervical pleura and suprapleural membrane. Sympathetic trunk and right recurrent laryngeal nerve, which hooks the undersurface of the right subclavian artery. Phrenic nerve (on right side only). Apex of lung covered by the cervical pleura and suprapleural membrane. Lower trunk of the brachial plexus and scalenus medius muscle. 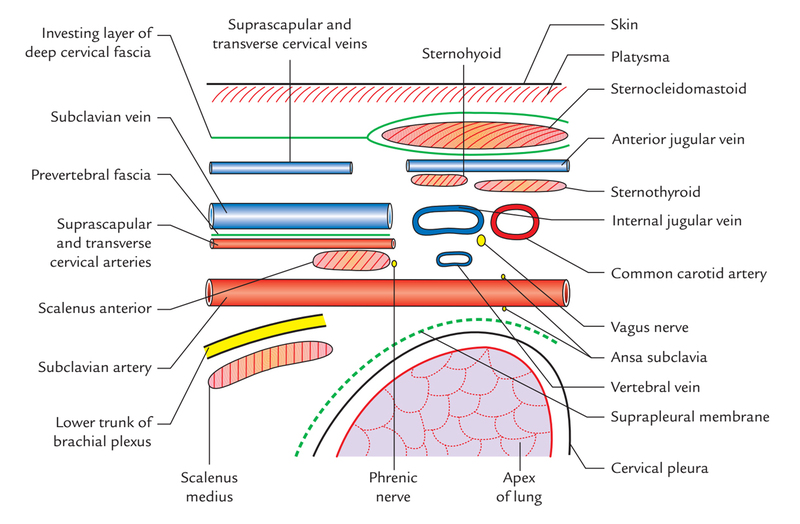 Suprascapular and transverse cervical vessels. Subclavian and external jugular veins. The next part creates the peak of the arch of the subclavian artery and climbs 1.5-2.5 cm above the level of the clavicle. It comes via the gap between scalenus anterior and scalenus medius muscle together with lower trunk of the brachial plexus. Method to subclavian artery: The 3rd part of the subclavian artery is the most superficial and its pulsations can be felt on deep pressure. It’s found largely in the supraclavicular triangle, where it is located on the very first rib. It can be compressed against the very first rib by pressing downwards, backwards and medially in the angle between the clavicle and posterior border of the sternocleidomastoid muscle. It can also be ligated conventionally at this site. The blood supply to the upper limb isn’t hampered because of sufficient collateral circulation. Cervical rib may compress the subclavian artery as it goes through the gap between the scalenus anterior and scalenus medius muscles. This can be examined medically when the patient’s chin is turned upwards and to the affected side after a deep breath the radial pulse is decreased or obliterated (Adson’s evaluation). Aneurysm may grow in the 3rd part of subclavian artery. The pressure as a result of aneurysm on the brachial plexus causes numbness, weakness and pain in the upper limb. Dysphagia lusoria: The right subclavian arterysometimes may originate from descending thoracic aorta and compress esophagus resulting in trouble in swallowing. This illness is referred to as dysphagia lusoria.